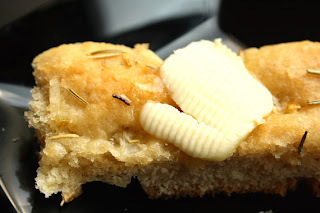 This recipe for Roman bread is adapted from the writings of Marcus Gavius Apicius who is believed to have been a Roman gourmet and lover of luxury. He lived sometime in the 1st century AD, during the reign of Tiberius. The Roman cookbook Apicius is often, but incorrectly, attributed to him. 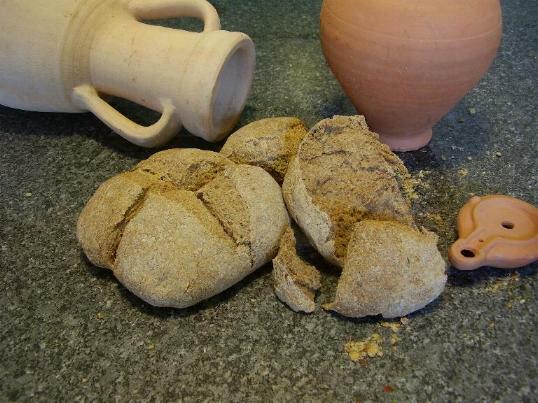 So, how do you make Roman bread? To begin with, dissolve the honey into the warm water and sprinkle the yeast on top. Mix together with a spoon and leave for 10 minutes until frothy. Put the finely chopped onion, flour and salt into a bowl, then add the oil and yeast mixture. Knead the mix until it smooth and no longer sticky - you may need to add a little more flour to achieve this. There are two choices that can be made now depending on the type of bread you want to end up with. Place the dough into well oiled bowl, turning it over to give it a fine coat of oil. Cover the bowl with a damp cloth and allow the dough to rise until it has doubled in size. This will take about 1 hour. When ready, punch the dough back down, the flatten it out onto an oiled cookie sheet to about an inch thick. Sprinkle with salt and the dried Rosemary. Bake at 400 degrees for 20 to 25 minutes, then serve hot. Divide the dough into three and then knead each piece on a lightly floured board until smooth and round. Shape each piece into a ball then flatten slightly with the palm of your hand and mark the top into portions with a sharp knife - 8 in this instance. Place into floured bowl then cover with a damp cloth and allow the dough to rise until it has doubled in size. This will take about 1 hour. Place onto a lightly oiled baking tray and bake in a pre-heated oven at a temperature of 230 degrees Celsius, 450 Fahrenheit or gas mark 8 for 20- 30 minutes. Remove the loaves from the oven. They should sound hollow when tapped on the bottom, of not, put back in the oven for another 5 - 10 minutes. Cool on a wire tray. 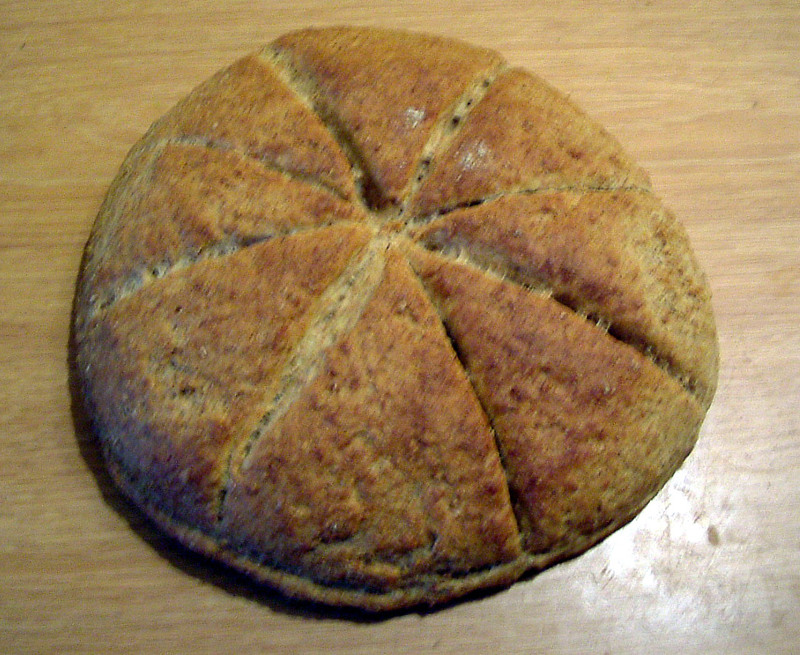 Your Roman bread can be eaten within 36 hours or can be frozen and eaten at a later date. ROME: Who were the Ancient Gladiators? WHAT IS THE WORLD'S LARGEST EAGLE? WHAT IS THE WORLD'S LARGEST SPIDER? WHAT IS THE WORLD'S FASTEST FISH? HOW LONG CAN A FLYING FISH FLY FOR? CAN FLYING FISH REALLY FLY? WHAT IS THE BIGGEST FLOWER IN THE WORLD? WHAT IS THE WORLD'S MOST POISONOUS SNAKE? HOW BIG IS THE BLUE WHALE? WHAT IS THE WORLD'S MOST POISONOUS SPIDER?